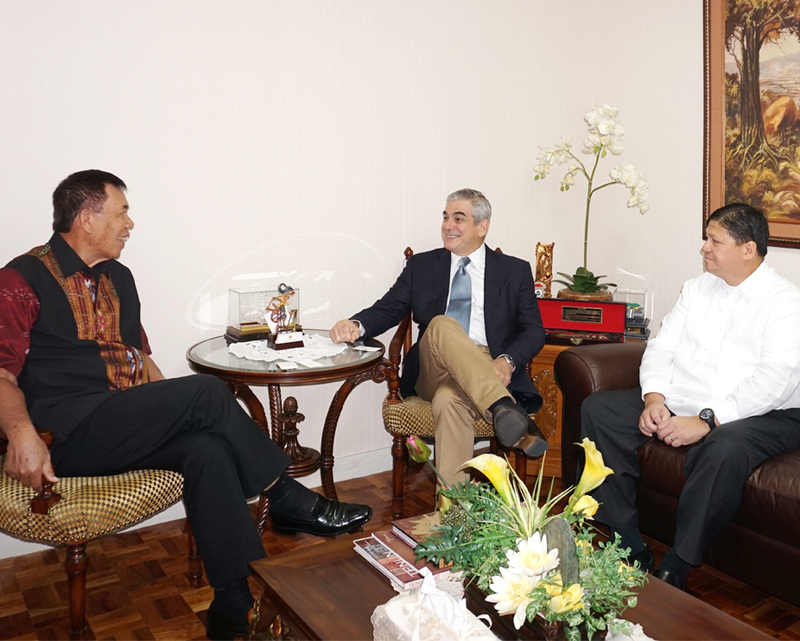 February 17, 2017 — Ayala Corp. Chairman and CEO Jaime Augusto Zobel de Ayala and AC Energy President and CEO Eric Francia made a courtesy call on Indonesian Ambassador to the Philippines Johny J. Lumintang at the Indonesian Embassy in Makati City. In December 2016, AC Energy, through a consortium, won the bid for Chevron’s geothermal assets and operations in Indonesia and the Philippines. In Indonesia, Chevron subsidiaries operate the Darajat and Salak geothermal fields in West Java, with a combined capacity of 235MW equivalent of steam and 402MW of electricity. In the Philippines, Chevron subsidiaries have a 40 percent equity interest in the Philippine Geothermal Production Company, Inc., which operates the Tiwi and Mak-Ban geothermal field in Southern Luzon and supplies steam to power plants with a combined name plate capacity of around 700MW. Thereafter, AC Energy broke ground to start construction of a 75 MW wind farm in Indonesia. Last January 2017, AC Energy signed investment agreements with UPC Renewables Indonesia Ltd for the development, construction, and operation of a wind farm project in Sidrap, South Sulawesi, Indonesia (the “Sidrap Project”). The Sidrap Project is targeted for completion by the end of 2017, and will be the first utility-scale wind farm project in Indonesia once completed. The Sidrap Project is the first greenfield offshore investment of AC Energy, through its affiliate, AC Energy International Holdings Pte Ltd., a Singapore private limited company. With AC Energy’s recent investments, its renewable energy portfolio tripled to more than 260MW. This is expected to further quadruple by 2020 and reach 1000MW of renewable energy capacity.